Through photos, Becca gives us a sense of the building–its exterior and interior spaces–at Portland’s PDX Commons cohousing. 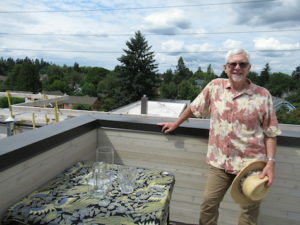 In July, I got a chance to visit PDX Commons, a mixed-use senior cohousing community. Lew Bowers, a member there, gave me a tour about five days before their move-in day. I was especially interested in PDX Commons because their site is quite small: half an acre. How did they fit it all in? The Bassett Creek core group anticipates a similar tight fit in an urban location. Here is a view from across the road. Food carts used to be in business on their lot. Now, those have moved to a parking lot across the street. 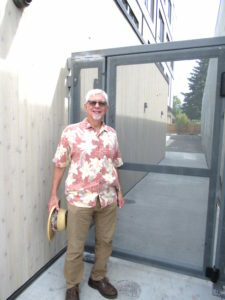 Here, Lew is in front of the gate leading to a sidewalk on the west side of the building. It can be locked for security. Aaron, the construction manager for Abbott Construction, stands in a retail space on the ground/sidewalk level. They do not have a tenant yet, but there are other small shops nearby as well as the food trucks. Here is the parking. One can drive in off Belmont Street. Note that the “open” window actually has a metal security lattice. 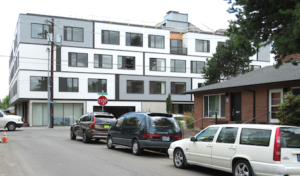 Unlike some areas, Portland did not require one car parking space per unit. Portland did, however, require bicycle parking. Here I am in the bike area. 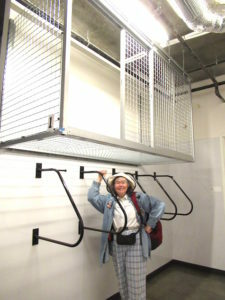 Also, each unit has a cage of general storage, here shown above the bikes; additional storage units may be in another area. 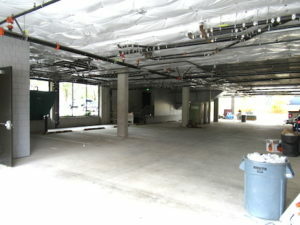 The main entrance for PDX Commons is to the right of the garage door and to the left of the retail. It brings you into a “living room” of common space. 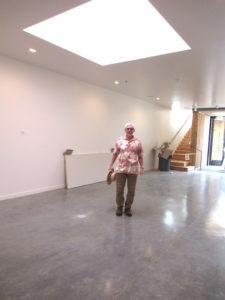 Lew is standing under the skylight in the center, and beyond to the right is a fireplace. They plan to make this inviting with couches, bookshelves, etc. The stairs (and elevators, not shown in my photo) lead up one level to the patio and the dining and kitchen areas. At the far end of the living room is a door to a small amount of outdoor space, the use of which is as yet undetermined; because this area is possibly a future hot tub location, another door goes through to a restroom/changing room. Lew took me up the elevator to the second floor patio. All the units look out onto this patio. 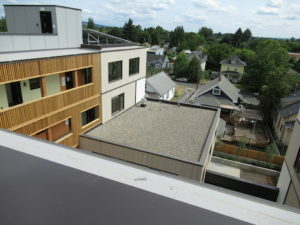 This shows the rooftop patio looking towards the street. A table is spread for their opening celebration. 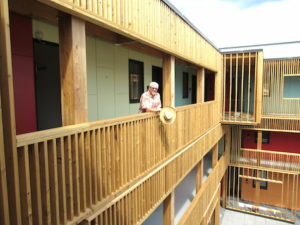 The walkways, with wooden railings going in front of the units, serve as corridors to get to one’s unit and social space. Two bump outs on the fourth level will be conversation areas. 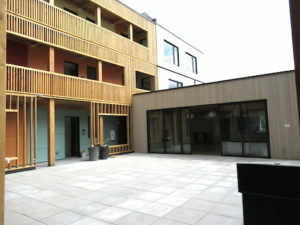 The design with the common patio on top of the lower level gives a very connected outdoor space to the residents. 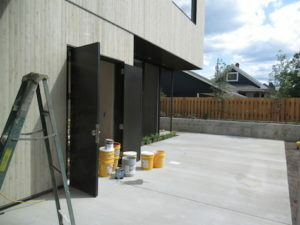 At the same time, it is a very private space, not visible to people going by on the street, or even to their neighbors out the back. Here, we are looking toward the dining room with big sliding glass doors. 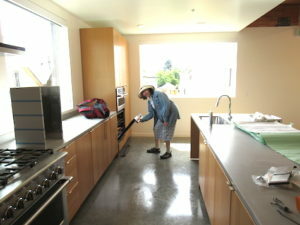 Going into the dining room and straight on into the kitchen, I am opening the oven in their kitchen. 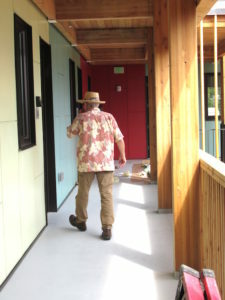 Lew on a walkway–you can see a bump-out of the walkway on the top level for a conversation area. This photo shows the width of the walkways. I got a view looking west towards Downtown Portland, which shows the solar panels, and how the end unit on the “arms” of the building are wider. Where the wooden framework ends and the siding of the unit begins, those are the big units. 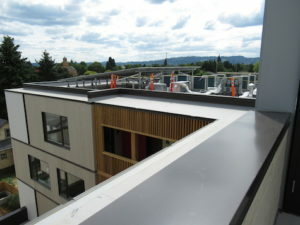 On the other arm of the building, see how the dining and kitchen area are attached. PDX considered a green roof, but ended up not doing it. However, all their drainage water goes into planters on the back perimeter of the property. Conforming to federal water-quality protection standards for runoff, Portland building code says you have to contain your drainage. 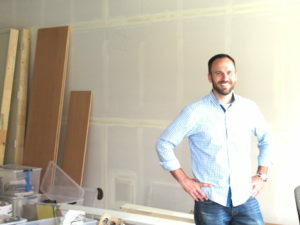 I left energized with the possibilities for the Bassett Creek location in Minneapolis! Becca Brackett is a board member of Twin Cities Cohousing Network and a member of the Bassett Creek Cohousing Core Group.